Now that everyone has had a chance over the past month to experience the story of Arthur Morgan and the Van der Linde gang in Red Dead Redemption 2, early access to the Red Dead Online beta started today, working up to full public access on Friday, 20 November. Built from the ground up for the latest hardware, Red Dead Online blends the multiplayer of the original Red Dead Redemption with the best of deep multiplayer experiences. With the gameplay of Red Dead Redemption 2 as its foundation, Red Dead Online transforms the landscapes, cities, towns and habitats of Red Dead Redemption 2 into a new, living online world ready to be shared by multiple players. Create and customise your character, tailor your abilities to suit your play style and head out into a new frontier full of things to experience. You can xplore this huge world solo or with friends. Form or join a posse to ride with up to seven players; gather around the fire at your camp; head out hunting or fishing; visit bustling towns; battle enemy gangs and attack their hideouts; hunt for treasure; take on missions and interact with familiar characters from across the five states; or fight against other outlaws in both spontaneous skirmishes and pitched set-piece battles; compete with other players or whole posses in open world challenges and much more. 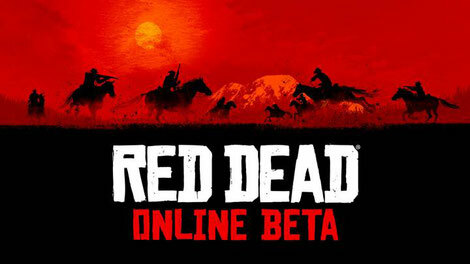 The launch of the Red Dead Online Beta is the first step in what will be a continually expanding and dynamic world, and the beta period will allow the developers to deal with the inevitable turbulence of launching any online experience of this size and scale. The Red Dead Online Beta will be available to anyone who owns Red Dead Redemption 2 on PlayStation 4 or Xbox One starting Friday, 30 November. When booting up Red Dead Redemption 2 and arriving to the title menu, you will see an option in the top right of the screen to select online.